Seems impossible. Doesn’t it? But it is true. What does a true family birthday party require? A Cake, Family and Close friends. Even though the people living outside the country have some close friends with them, what they truly miss are the family and friends back home. But it was not possible for them to have a lively experience of the party in the first-place due to many technological limitations. But the times have changed and these constraints have come down allowing us to share the moments together, virtually. Do you know about Live Streaming Devices? The answer is not Skype calls. It is much better and livelier than that. This magic can be achieved through live streaming devices like Freedocast that can transmit large amounts of data while it is still recording. These devices which are named live streaming devices are capable of streaming copious amounts of data which means you can connect a Camera with HD resolution and live stream all that is being recorded. A steady internet connection is all you need. Live streaming devices lets you stream your video in HD quality which is the first requirement of a lively experience. The device can be connected to a video mixer if more than one video sourcesare existent. They allow an input from the microphone or the sound mixer making the audio clearer which forms another key factor. How can you Live Stream? Live streaming with the devices is massively easy as the device is Wi-Fi operated and can be controlled via a Remote App. With just one touch you can start/ stop the live stream and with just one touch you can choose where you want to live stream. The device also allows live streaming to various social media platforms and your personal website simultaneously. 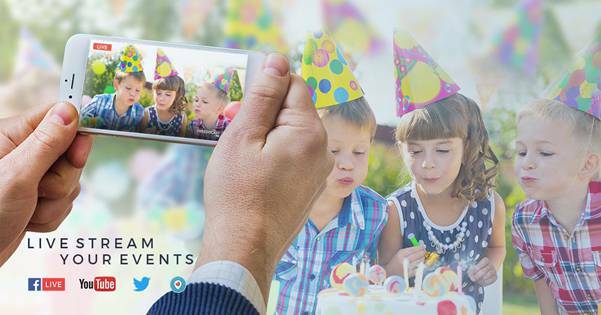 So, when you plan to live stream your Birthday event, all you need to do is connect the device to the camera and pair it with the app. And you are good to go. Ask your friends to log in to the same account and they can enjoy the event which will seem like it is happening practically in front of their eyes. What makes the live streaming special? The pain of loved ones not being able to enjoy with us is only known to some people. This application soothes that pain to some extent. The broadcasting of events might seem like a bit of an oversell but the practicality of this application transgresses boundaries. The usage is not restricted to a virtuality as it can be made real with celebration going on at both ends. A Cake is what makes the birthday special. Insert that into the gathering of people watching the event and you will have a celebration which is practically two-sided. Include another camera and device on the other end and it becomes a full-fledged party with a virtual audience. Live streaming erases the distance that exists between the continents and the people. This feature, is the inception of a virtual realityconversations which can be the future of communication. The device is available on Amazon for and you can order it from anywhere in the world. You can know the details of the working from the website manual. The company also provides demos for some plans.Check out the link to know more.